The consultants at Ergo Life Solutions will partner with you to meet the unique needs of your organization. Disabled or Injured Workers Ergo Life Solutions will conduct a needs assessment and worksite evaluation/consultation for the disabled or injured worker. We will establish services that are necessary to introduce or return disabled or injured employees to work. 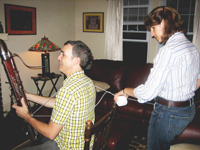 Ergo Life Solutions is not limited to office settings. As an occupational therapist, Barb is expert at analyzing any job task and providing strategies to improve safety and reduce risk. Ergo Life Solutions will create a unique one-to-one relationship designed to help you overcome challenges, plan for the future, and maximize success. Professional coaching helps you explore and realize your full potential as an executive, as a team member, or as a leader. Ergo Life Solutions will develop a one-to-one a partnership designed to empower clients to discover powerful moments of choice, creating lasting personal and professional change. Ergo Life Solutions will design custom organizing systems and teach organizing skills to help individuals and businesses take control of your environment so that you can use time more effectively. 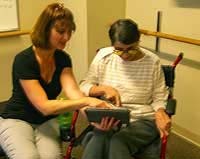 Barb helps a client using a wheelchair to access a tablet. Barb demonstrates a safer technique for styling hair. Barb simulates a strap to support a Bassoon.